December 9 marked the establishment of the “Liaison Committee for Prefectural Referendum to Demonstrate Popular Will Against Henoko Reclamation and New Base Construction” in preparation for the prefectural referendum to be held on the issue of land reclamation in Henoko, Nago City, Okinawa as part of the relocation of U.S. Marine Corps Air Station Futenma. The committee approved a set of rules and joint representatives and other officers at an inaugural meeting held at the community center in Naha City. Going forward, the committee will engage in a prefecture-wide action to encourage people to cast their vote in opposition to the land reclamation. At the inaugural meeting, participants vowed, “We will not under any circumstances allow a new base to be built in Henoko. Okinawans will decide Okinawa’s future without being at the mercy of the Japanese and U.S. governments. 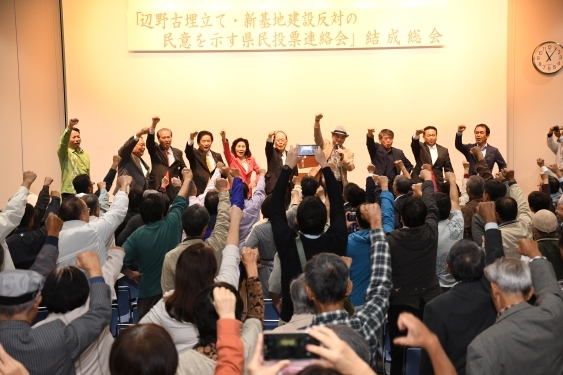 Let’s embark in high spirits on a historic struggle to pave the way to a new future for Okinawa.” This mission was adopted with thunderous applause from the 250 participants from 56 groups (according to organizer estimates). Former Nago mayor Susumu Inamine, Kanehide Group chairman Morimasa Goya, University of the Ryukyus Graduate School of Law professor Tetsumi Takara, and Terumasagumi chairman Yoshimi Teruya were selected as joint representatives. The committee plans to have six representatives and is currently searching for two female representatives to fill the remaining slots. A planning and coordination council comprising members of the prefectural government’s ruling party, labor unions, and businesses was behind the planning of the liaison committee in advance of the prefectural referendum to be held in February of next year.